This indicator depends on the variety of ways which NordicBet Casino offers his clients to contact customer support and the speed with which it solves a problem, as also the overall customer experience. 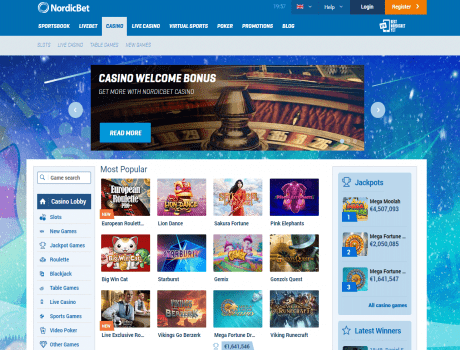 The reputation rating of NordicBet Casino is based on its popularity in online space - comments, user ratings on other sites, and social networking likes. To get you started, Nordicbet casino are giving you an 100% bonus on your first deposit, up to 50 Euros. And as part of your welcome offer, we will also credit you with 25 Free Spins! These Free Spins can be used on Starburst, Mega Fortune Dreams, Gonzo’s Quest, South Park Reel Chaos or Twin Spin when you make your first deposit. The minimum deposit is €10. The Bonus offered is 100% up to €50. Only new Casino players are eligible for the Casino bonus. The Welcome Bonus must be wagered 35x in Casino before withdrawal can be requested on the deposit, bonus and/or winnings. This offer is only valid for players who are not from any of the following countries: Norway, Sweden, Finland, Czech Republic, Germany, Austria and Switzerland. The offer is only valid ONCE per customer/account, family, household, address, e-mail-address, cardnumber and/or IP-address. Using double or nothing/gamble function on slot games with the signup bonus is not allowed. Players playing on these games could have their bonus and potential winnings confiscated. The wagering requirement for this bonus must be met within 14 days or else the funds will expire. The 25 Free Spins are available exclusively on Starburst, Mega Fortune Dreams, Gonzo’s Quest, South Park Reel Chaos or Twin Spin. Only new players in Casino are eligible for the bonus. Existing funds on a customer’s account will be used before any bonus funds from Free Spins can be wagered. The bonus money must be wagered 35x before withdrawal can be requested on the bonus and/or winnings. The wagering requirement from the Free Spins winnings must be met within 3 days or else the funds will expire.